I completed my Bachelor’s degree in Computer Engineering from the Institute of Engineering – Pulchowk Campus, Tribhuvan University (Kathmandu, Nepal) in 2009. For my undergraduate degree’s final year project, I worked on Real Time Face Tracking and Recognition (RTFTR) which is an open source project that can track and recognize human faces in a video stream. It was this project that inspired and propelled me into a research career leading to a doctoral research in Computer Vision and Machine Learning. Real Time Face Tracking and Recognition (RTFTR) is an open source project that can track and recognise human faces in a video stream. RTFTR was used as a platform to study the effectiveness of multiple face detection and recognition algorithms working in unison. We also created the IOE Face Database which contains photographs of 13 subjects with around 12 pose variations for each subject. This face database was used to test the performance RTFTR. Version 0.1 of RTFTR was submitted as the final year project for our undergradute engineering degree at the Institute of Engineering – Pulchowk Campus. Adding gtk based GUI and with some performance improvements due to OpenMP, we released version 0.2 and participated in Open Software Challenge Nepal (OSCN) 2009. Our project was awarded the second prize in this national software competition with more than 70 competing projects. RTFTR has been downloaded 3,638 times from 83 countries. Intelligent Multiplayer Snake – iSnake is a multiplayer snake game created in Java. We used Java SWING to create the user interface and Apache MINA was used for the multiplayer functionality. The initial version of iSnake was submitted as the 3rd year minor project of our undergraduate engineering degree at the Institute of Engineering – Pulchowk Campus. I started this project to create a digital archive of all the projects completed at the Institute of Engineering – Pulchowk Campus. When I was planning my final year project, I felt the need for such a digital archive. At that time, our college had such an archive only in hard copy format in the library. This project is now being maintained by a current 4th year student (3rd generation maintainer) at the Pulchowk Campus. In this project, we created an animation of a robot (made up of rectangles) walking along a fixed path. We submitted this project, as the project for our 3rd year Computer Graphics module. Camera viewpoint, Walking Speed, Zoom Level can be changed using the simple controls provided in the Java GUI. I contributed code to add support for Nokia 6100 color LCD in the serdisplib project. In fact, this was my first contribution to the open source world. I illustrated the use of mobile phone LCD interfacing using a simple python application called “gmail2lcd”. This application displayed alert on the mobile phone LCD on receipt of new email. An article titled “Using ‘serdisplib’ library to drive mobile phone LCD” was published in the “Do-It-Yourself” section of Electronics For You (May 2008 issue) magazine. This was the first time when I was paid money for writing an article. I have been reading this magazine since I was 12 and was delighted to see my name in one of the articles of this magazine. We participated in the IEEE CHC61 web design competition with this website. The theme of this competition was “Unsung Heroes”. 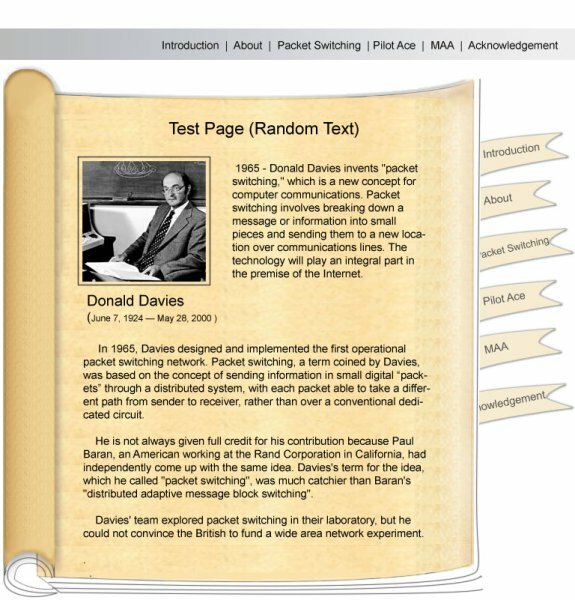 This website pays tribute to Donald W. Davies who was responsible for one of the fundamental concepts that enables today’s advanced computer networking systems: digital packet-switching. The result of the competition was announced on Aug. 30, 2007. Unfortunately, our entry did not make into the TOP 10 list of finalists. Note : It seems that I have lost the background images required to display this website correctly. See this image for a screenshot of original website design. We created a VERILOG model of a computer based on SAP-1 (Simple As Possible) architecture. The final lab assignment of our 5th semester module “Computer Architecutre and Design (CAD)” required development of this SAP-1 computer VERILOG model. SAP-1 (Simple As Possible) architecture was introduced by Albert Paul Malvino in his book Digital Computer Electronics – An Introduction to Microcomputers: SAP-1(Page 140). Tata McGraw-Hill Publishing Company Limited 1990. We did this project while exploring the wonderful world of hobby electronics. We designed an interfacing circuit to access the I/O lines of Industry Standard Architecture (ISA) bus available in some old motherboards. This provided us with 32 general purpose I/O lines. An article describing this project was published in the March 2006 issue of the linuxgazette magazine. 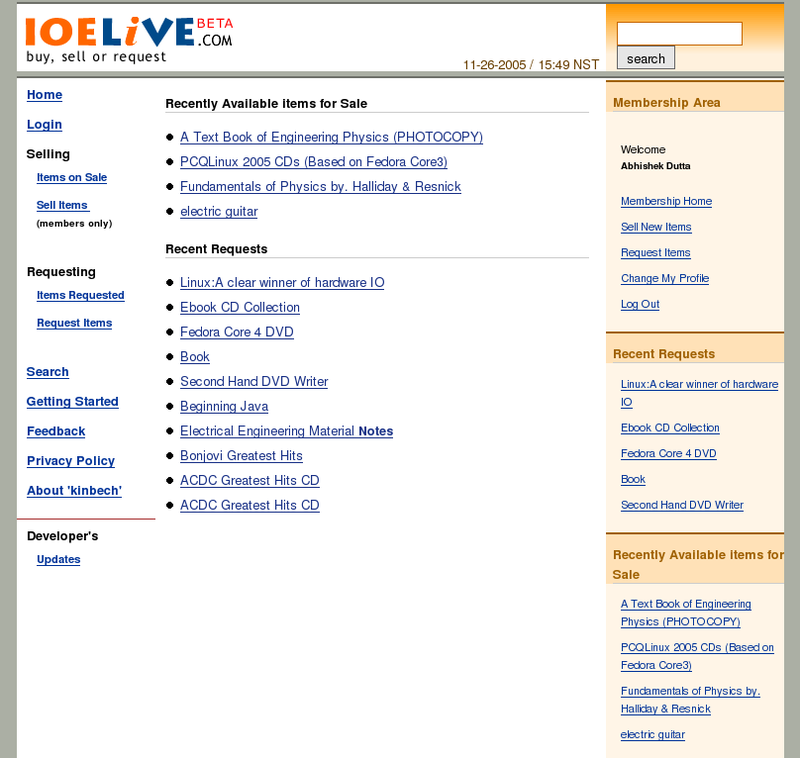 Screenshots: ioelive main page, kinbech main page (captured on: Nov. 26, 2005). 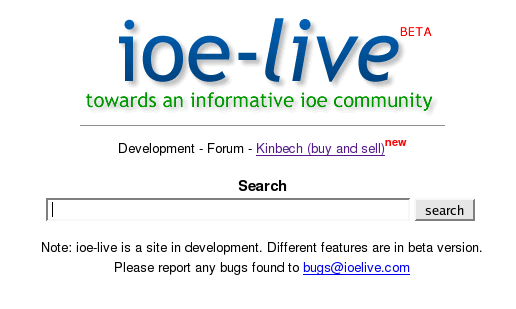 kinech@ioelive was launched on Oct. 03, 2005. However, kinbech was not widely used probably because it lacked online payment system and robust delivery scheme. We are always looking for programmers and designers to work on this site. As we do not make any money through this website, we will not be able to pay you anything for your work.We are eager to add new member’s to our team.You only need to have hands on experience with php-mysql-apache-html.You can contact us at our email. If you think there is something missing or you have come up with a great idea that would be worth putting on this site, send it to us at ioelive at gmail.com. We will add your stuff with proper credit to you at IOELIVE. You can send us your idea about anything in this website(design,codes,articles, …. ).